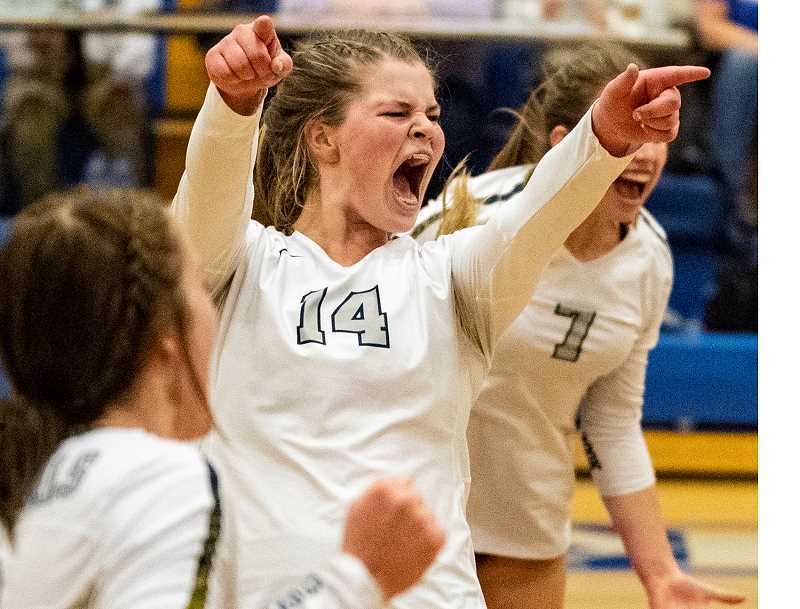 The Crook County Cowgirls fought their way back from the brink of elimination as they found a way to take a five-set thriller from the North Eugene Highlanders, earning a berth in this year's OSAA Class 5A State Volleyball Tournament. 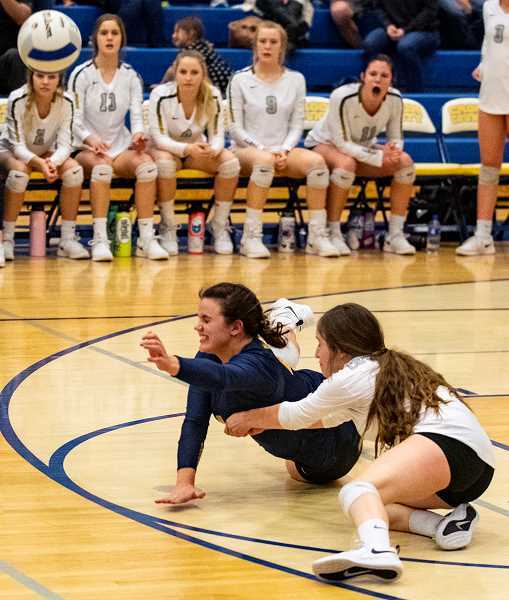 "I honestly feel like we played with more heart than we have ever played with," an emotional Crook County head coach Baylee Dunkel said following the match. "They wanted it, and they just came out and gave it their all — they were all out for five sets." Crook County outlasted North Eugene, taking a 24-26, 25-23, 16-25, 25-20, 15-10 victory over the Highlanders. The Cowgirls came out on fire in the opening set, jumping out to a 4-0 lead. Crook County continued to lead for much of the set before the Highlanders tied the set at 22-22 on a kill by Alexis Hobie. The Cowgirls had no answer for Hobie most of the night as the 6-0 outside hitter blasted 26 kills through the five sets. North Eugene took the lead on another Hobie kill at 23-21, but moments later, the Cowgirls tied things up on a Raegan Wilkins kill. Wilkins also finished the match with 26 kills herself on 85 attempts. The Highlanders went on to win the opening set 26-24 on a kill by Taylor Londo and a block of Wilkins by 6-0 setter Hannah Randall. It looked like the Highlanders had all the momentum in set two as they jumped out to a 5-0 lead. However, the Cowgirls battled back, tying the set at 8-8 on a block of Hobie by Liz Barker. The two teams traded points the remainder of the set with the Cowgirls scoring four of the last five points as Wilkins picked up a kill, and freshman Kendall Maykut added two kills as the Cowgirls took the two-point victory to tie the match at one set apiece. North Eugene quickly jumped out to a big early lead in set three, with kills by Hobie and Randall and a Randall ace, grabbing a 6-0 lead. The Cowgirls never got closer than six points the remainder of the set as the Highlanders rolled to the 25-16 win to open up a 2 games to 1 lead over the Cowgirls. When Hobie blasted a kill to open the fourth set, it looked like it might be the end of the season for the Cowgirls. However, the Cowgirls battled back. Trailing 17-15, the Cowgirls called time out. During the timeout, assistant coach Mallory Hall exhorted the team. "They want it more than you right now," she said. "If you want to go to state, you have to show some heart." The exhortation seemed to work as the Cowgirls settled down and battled their way back. The set was tied nine times, and the Highlanders held a 20-18 lead before the Cowgirls finally scored the final seven points of the set as Maykut, Wilkins and Kenna Woodward all had kills in the stretch to go with an Anna Woodward ace. 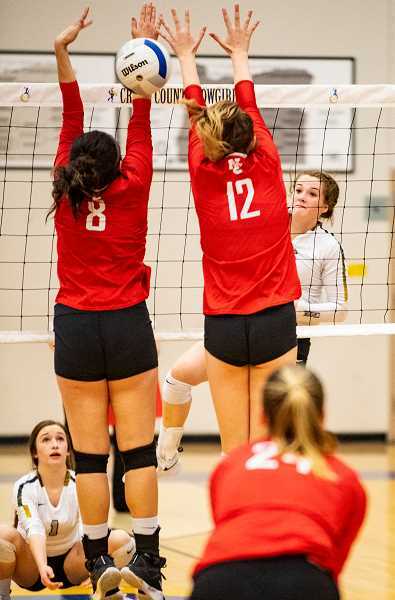 The 25-20 victory set the stage for a fifth and final set to 15 points with the winner heading to the state tournament and the loser ending their season on a disappointing note. "Hobie really hurt us," Dunkel said. "But we switched up our defense, and our defense had really good eye work from the back row, and we were able to take her out of the game late. I'm so extremely proud of our team." North Eugene opened the set with a kill by Hobie to take a 1-0 lead. However, from that point on, it was all Crook County. The Cowgirls rolled off eight consecutive points to take an 8-1 lead and take control of the set and the match. Wilkins was on fire in the run with three kills and a block, while Kenna Woodward served seven consecutive points, including an ace. The Highlanders attempted to rally, but with the Crook County defense picking up virtually every shot that the Highlanders could fire, and Crook County held on for the win. "It just shows how hard my team works and how much we really want it," said Crook County senior libero Mekynzie Wells, who led all players with 32 digs. "I couldn't be more excited, and now everything that we've worked for is finally here. We all did it when we most needed to." Wells was far from the only Cowgirl to have a great defensive match. Kacie Stafford finished with 22 digs, while Wilkins added 15, and both Anna Woodward and Stormie Camara finished with seven. Maykut added eight kills in the match, while in her first action since spraining her ankle two weeks earlier, Kenna Woodward added seven kills. "It was pretty crazy because we lost and then we came back and then we lost again and we came back again," Kenna Woodward said. "I'm so proud, and I'm excited to go to state with these girls." The marathon match, which lasted two hours and 30 minutes, couldn't have been closer. In the entire match, the Cowgirls scored just one more point than the Highlanders. Crook County finished with 49 kills to 40 for the Highlanders, but North Eugene had eight aces to six for the Cowgirls. Anna Woodward did a great job of running the offense, finishing with 45 assists on the 49 kills. "We just put our hearts into it," Wilkins said. "We've been saying do it for state, and that's what we did. It was really emotional. The coaches just told us to remember fundamentals, and that's what we did. We remembered all the fundamentals, and we came back and won. I'm very proud of the team." Things don't get any easier for the Cowgirls in the quarterfinals. Crook County, 20-10, will face second-ranked West Albany, 21-4, at Liberty High School on Friday, Nov. 2 beginning at 10 a.m.
West Albany's only losses are a pair of defeats to No. 1 ranked Corvallis and two losses to Class 6A playoff teams. The winner of Friday morning's match will advance to the Friday evening's semifinals, which are scheduled to begin at 6:30 p.m. The loser will fall to the consolation bracket where they will play at 8 a.m. on Saturday morning. "This week in practice, we are really going to hone in on the little things like really closing the block," Dunkel said. "Our defense usually takes care of itself, so I think that working on the front row and just playing through those down times that we get are crucial to winning." The Intermountain Conference and the Mid-Willamette Conference have both shown their dominance in the first round of the playoffs with each league sending three teams on to the state quarterfinals. In addition to Corvallis and West Albany, Dallas will represent the Mid-Willamette Conference, while Ridgeview and Hood River Valley have both advanced from the Intermountain Conference. Although playing the No. 2 ranked team in the state may seem daunting, the Cowgirls are confident. "We are going to go and do the best that we can, and our overall team goal is to hopefully win 5A state," Wells said.